The empanadas come from the “Old World", it is believed that they originated in Persia. In those times the empanadas consisted of bread filled of a food . Although the recipe evolved until it became to what it is today – puff pastry dough with a filling. *The noun empanada is derived from the verb empanar that is the action of enclosing something in a bread dough to cook it in the oven. The empanadas came to Mexico through the Spaniards and when they touched Mexican soil they started to be prepared with typical Mexican ingredients – and that’s how the Mexican empanadas were born. So now, get ready to try a tasty crispy dough, which will be filled with mushrooms and epazote – the specialized herb in giving the authentic Mexican flavor. In no time you will have on your table a delicious mouthful full of flavor and aroma. What is fascinating and exciting about the empanadas is that they can be eaten for breakfast , appetizer , main course and some empanadas are even dessert. It is always a good moment to enjoy an empanada. This recipe is not difficult to make but it requires a lot of attention. So be patient, work carefully and your empanadas will be fabulous. The best empanadas... the most crispy are prepared with puff pastry dough therefore use this dough, that you can prepare yourself o it can be bought. 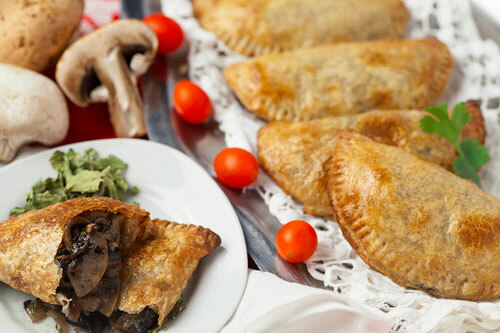 The mushrooms that can be used to fill these empanadas can be champignons or portobellos. Try to use fresh epazote but if you don’t find it don’t worry, substitute it for 2 teaspoons or dried epazote. The total preparation time is of 35 minutes but while the empanadas are baked (20 min.) you won’t work in the recipe. This recipe is for 8 empanadas. Clean 10.5 oz of mushrooms. Finely chop the mushrooms that were cleaned, 1/4 of an onion and 2 epazote sprigs; then set aside. The Epazote sprigs that were minced. Mix the frying pan ingredients and fry them for about 5 minutes, until the mushrooms are lightly fried and the water that they release has totally consumed; stir regularly. Then set aside. Put on a rolling pin and on your work table 1 tablespoon of flour. Stretch uniformly with the rolling pin 14.1 oz of puff pastry dough, until it has a thickness of .2’’. Place an empanada press over the puff pastry dough that was stretched and cut dough circles, until having about 8 puff pastry dough circles. If you don’t have an empanada press don’t worry. Just put 1 large glass with wide rim over the puff pastry dough and start tracing and cutting dough circles. If there is some puff pastry dough remaining it can be used to make more empanadas or other recipes. Put some of the filling that was cooked on one half of each puff pastry dough circle that was cut, then reserve. Don’t put a lot of filling because at the moment of baking the empanadas they may open and the filling may come out. Crack 1 egg and only pour the yolk in a bowl. Beat the egg yolk (that was put in the bowl) with a ballon whisk or with a fork, until it is well integrated. Dip a pastry brush in the beaten egg yolk and varnish just the superior edge of all the puff pastry dough circles (where the filling is). Fold all the dough circles in half and seal the ends by pressing with the fingers. Then press the dough edges with the fork. Dip the pastry brush in the beaten egg yolk and varnish the surface of all the mushrooms and epazote empanadas, except for the edges; then set aside. Preheat the oven to 430º F.
Smear on a baking sheet 1 teaspoon of butter, until it has a tiny butter layer that covers all the baking sheet. The butter is used so the empanadas don’t stick. Although wax paper could also be used. Arrange all the empanadas that were prepared on the baking sheet, in such a way that they don’t overlap. A lot of people like to poke the empanadas with a fork. We recommend you not to do that because the filling may come out. Introduce in the oven the baking sheet and leave the mushrooms and epazote empanadas baking for about 20 minutes, until they are moderately browned. We recommend placing the baking sheet in a medium hight so the empanadas brown perfectly. Tip: If you have some filling left, it can be used to prepare some delicious mushroom quesadillas. Did you like the Empanadas? The beauty of the “Dufour Puff Pastry Dough" is that it expands in all directions creating thin layers of dough with butter. You will love it! The “OXO Pastry Brush" doesn’t retain odors, doesn’t retain clumps, it is heat resistant and it holds very well the liquids that are transferred to the food. It is a brush capable of doing all the functions that one needs. In this bag with epazote you will find a high quality product because it is 100% natural, it has a good aroma, good flavor and your food will have that Mexican taste that you were looking for.